Plumbing planner Jannick Vestergaard and engineer Henning Nøhr pose with the sword. 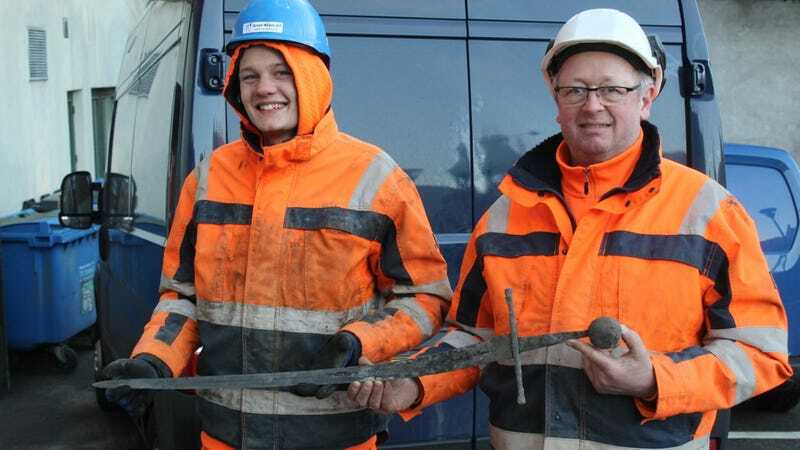 When plumbing planner Jannick Vestergaard and engineer Henning Nøh woke up on the morning of February 5th, it likely never occurred to them that their day’s work would result in the discovery of an extraordinary double-edged sword dating back to the 14th century. Vestergaard and Nøh were conducting sewer work on Algade, a street in central Aalborg, Denmark, when, to their amazement, they saw a sharp blade sticking out from the ground. Figuring it was something special, the duo contacted Kenneth Nielsen, an archaeologist at the Historical Museum of Northern Jutland, reports The Local. Nielsen later later confirmed the relic as being of medieval origin in a museum statement. The completely intact, well-preserved sword was found atop the oldest layer of paving on Algade. Findings from this layer “have always pointed to the 1300s, so the sword must have [entered into] the earth [during] this century,” according to the museum. The Medieval sword weighs just slightly over 1 kilogram, or 2.2 pounds. The blade, which the museum described as “still sharp,” measures 93 centimeters long (36.6 inches). From pommel to tip, the sword is 112 centimeters (44 inches) in length. Nielsen’s analysis found that it was a high-quality sword made with great skill. The narrow blade made the sword very light, and a recess running along the blade made it even lighter and thus easier to handle. Other elements, such as the quality of the disk-shaped pommel, the straightness of the cross-guard, and the blade’s rounded cross-section, point to a high level of craftsmanship. This was an expensive sword, according to the museum, and it likely belong to someone with lots of money, perhaps a member of the nobility—who in those days were also warriors. How this sword came to be abandoned is a mystery, but Nielsen suspects it was lost in battle. During the 14th century, Denmark was marred with civil violence, and marks on the sword suggest it was used in combat. Perhaps it was dropped during a melee, falling into the mud of the battlefield and never recovered, noted the museum release. The finders of the sword were allowed to pose with their prized discovery, but they weren’t allowed to keep it. From here, the sword will be cleaned, preserved, and placed on display at the Aalborg Historical Museum, “close to the place that the sword was lost hundreds of years ago,” according to the statement. In addition to the nice photo, Vestergaard and Nøh got to go home that day and declare, “You’re never going to guess what I found at work today,” and back it with one hell of a story.